Have looked in your garage (insert attic, basement, storage room if you prefer) lately? It is very likely that you might find it up overtaken by piles of junk you’ve “stored” there for any time from a few months to a few years (decades if there is “Walkman” lying around there). Obviously you did not create the giant pile of rubbish intentionally and it’s not necessarily a result of laziness. People have genuine difficulty in figuring what to keep and what to throw away. It is easy to end up with a multitude of useable items that you never actually use. Often by the time you realize what has happened clearing out the garbage is just beyond you, especially if there are heavy electrical appliances like old ovens in the equation. At this point the only option you really have is hire a professional company that does junk removals in Hammersmith. Going with the pros is always the better solution. If you hire a company like ours you save yourself a lot of time and energy and avoid the hazards that are always present during a rubbish removal. Instead of dealing with muscle strain you can just pick up the phone and arrange for a junk removal in Hammersmith at any time and address. We have a great team of phone support operators who are ready to process your order or give you additional information. The whole process of booking a waste clearance team is very easy. We’ll leave it to you to determine the details like “when”. We understand that the workdays are not convenient for a large part of our potential customers so we’re able to clear out the garbage on weekend and holidays as well. Regardless what the type of waste is our dedicated clearance specialists are prepared to deal with it. Each of our workers has extensive experience with all sorts of materials – metal, wood, plastic, various fabrics. Note our junk removals in Hammersmith exclude toxic and hazardous material – you should contact local authorities on further information about proper disposal. Call today to request your quote. You can do so over the phone or via email. The estimate you receive is based on the information you provide so the more accurate you are – the more accurate the number will be. In general pricing is calculated by the volume, however it is possible to calculate is by the weight for certain jobs that involve extraordinarily heavy items. There is no better company than ours for your junk removal needs in Hammersmith. We have versatile services and flexible options once you decide to get us for your garbage disposal. Get in touch with our representatives and ask for your free quote. We are open daily and can perform waste collection even during off days and holidays. Our workers based in W6 are finely trained and perfectly coached by our experts. We also have top class cleaning supplies. Hammersmith if in Inner London district, located at 4.3 miles from Charing Cross., in the borough of Hammersmith and Fulham. The district holds a strategic position for the transportation system of West London. Characteristic about local economy are the shopping centres and retail businesses as well as a number of office buildings. A number of large international companies have seat in the borough. Hammersmith is a west London district in the London Borough of Hammersmith and Fulham. The district is home to a major commercial and employment centres. 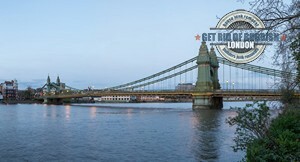 Here are situated some intriguing places of interest such as Riverside Studios, Lyric Hammersmith Theatre, Hammersmith Apollo and the Polish cultural centre. On the other hand, here you can enjoy some leisure activities in the riverside park of Furnival park and Ravenscourt Park. Don’t forget to visit the West London Penguin Swimming and Water Polo Club. You will struggle to find a better prepared junk removal company than ours in the W6 area. Call us and make a booking for professional Hammersmith waste collection. We have the required vehicles for the job. Depending on the nature of your garbage removal we will select the most appropriate van and will dispatch it. Larger scale rubbish removals might require flatbed lorries. We are available daily and you can hire us on a short notice too. Hammersmith is a district taking place in the London Borough of Hammersmith and Fulham. It is bordered by Shepherd’s Bush and the north bank of the River Thames. The area is mainly known for being a large commercial and employment centre of west London. However you can also enjoy some leisure activities here because Hammersmith is a home to some great places along the riverside such as pubs, rowing clubs, gardens and a municipal park.